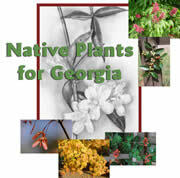 West Georgia Green Association - Gardeners! Parts are still under construction, so please mind the hoses and excuse the dust and mud. But we wanted to get your suggestions and comments so we could make this useful to you. Click around and take a look. Please send us an e-mail with your thoughts and suggestions! Treat your soil right and your plants will thank you! Soil testing kits $15 including pre-paid mailer. If you don't have space for trial gardens of your own, these organizations do. Trialed and tested, the winners of these awards might need a place in your gardens. Check 'em out here. and sponsor the area's best speakers! and most MG events are free. see Venus Flytraps in action! learn three new ways to make a plant! learn about the secret lives of flowers! "Researchers at Kansas State University already have shown that gardening can offer enough moderate physical activity to keep older adults in shape." Worried about your plants and the cold? has the info you need to keep your garden safe. Protect tender plants, and prune damage. Selected to thrive in your yard!